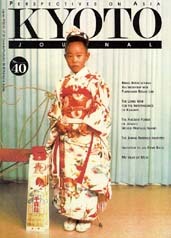 Around since 1986, KYOTO is an amazing periodical. With a unique perspective on Japan, Asia and beyond, KYOTO is committed to the preservation of endangered cultures and our biosphere. What is so amazing is that it is a very high quality effort- both in terms of graphic design and literary achievement- and it is totally non-profit and staffed by volunteers. In issue number #40, KYOTO addresses American visions of Japan, the rise of militarization, and the debacle of Indian policy on Kashmir to name a few. Better analysis and presentation is hard to find anywhere. May five nillion flowers bloom.